Nestled in the mountains of the Marche region of Italy, Cantiano is home to many woodland and natural food products and regional specialties. 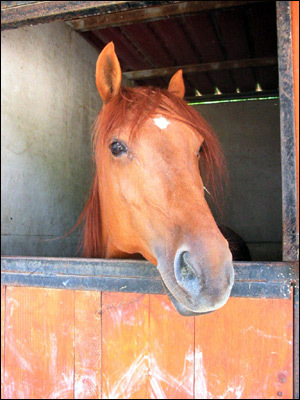 One such delicacy is la carne di cavallo, or horsemeat. The meat, unlike other meat delicacies, is not typically associated with special holidays or traditional events. It is consumed on a regular and informal basis. The production and eating of horsemeat, which is as popular as other meats and fish in Le Marche, has a rich and varied history. Catria horses originally populated the land near Cantiano and were named for the nearby Catria Mountains. Ceccarini said that she has been working at Carni Equine since she bought the business just over a quarter century ago. 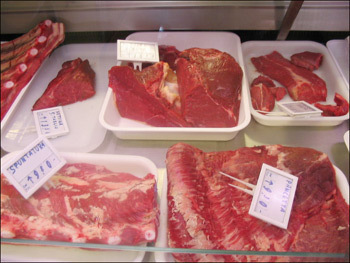 The meat found at Carni Equine as well as in other butcher shops in the Urbino-Pesaro province originally came from the Chiaserna, a town near Cantiano, and horsement production has since extended to Gubbio, Cagli and Fano. Horsemeat has the same traditional cuts as other meats, and it has a texture similar to veal — because of its age and the similarity between the muscle fibers. 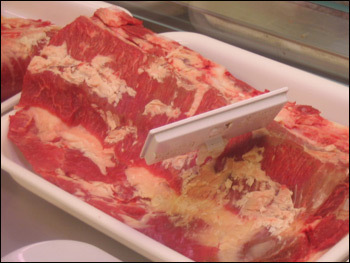 Much like beef, the best cut of meat from the horse is the steak, which is cut from the thigh with the bone attached. At Carni Equine, as in other butcher shops, the meat arrives already separated into cuts and ready to be sold. 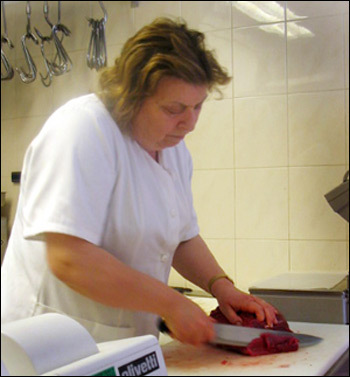 In this region, most of the butchering and distribution of horsemeat occurs in nearby Cagli. The pieces are sent out weekly to the various venues in the region to ensure freshness. Ribs, steak, sausage, roast, and ground meat are all readily available under the cool glass case at Carni Equine 365 days a year. “One of the best things about the meat is that it is not seasonal, and since the horses are raised and kept indoors, it always available and it’s always fresh to the shop,” said Ceccarini. Additionally, horsemeat is a major source of nutritional value. Though the specific nutrients differ from other meats, horsemeat is lean with almost no fat at all. Additionally, it has no cholesterol, which makes it appealing to those who have a passion for red meat and consume it on a regular basis. However, it does require seasoning because the meat is much more delicate than beef or veal. By nature it has a sweet taste and a soft texture. “The meat is popular because it is also very digestible,” Ceccarini said. In recent years the traditional recipes and ways to prepare horsemeat have spread out from Cantiano to other locales within the Marche region. Two restaurants in the area that are known for their horsemeat or puledri dishes are La Trattoria del Sole in Cantiano and the newly-opened Restaurante del Commercio in Cagli. Both businesses get the meat that is featured on their menus from Carni Equine on a weekly basis. Furthermore, in Cagli, many other restaurants use horsemeat as an ingredient in the salamis and sausages served in their antipasti. 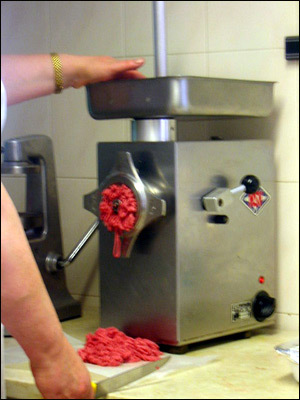 Although the delicacy is gaining popularity in Italy and throughout Europe, many people are still reluctant to engage cavallo, the other red meat.